Enjoy a day on one of the most scenic railway lines in England, The Settle and Carlisle railway. 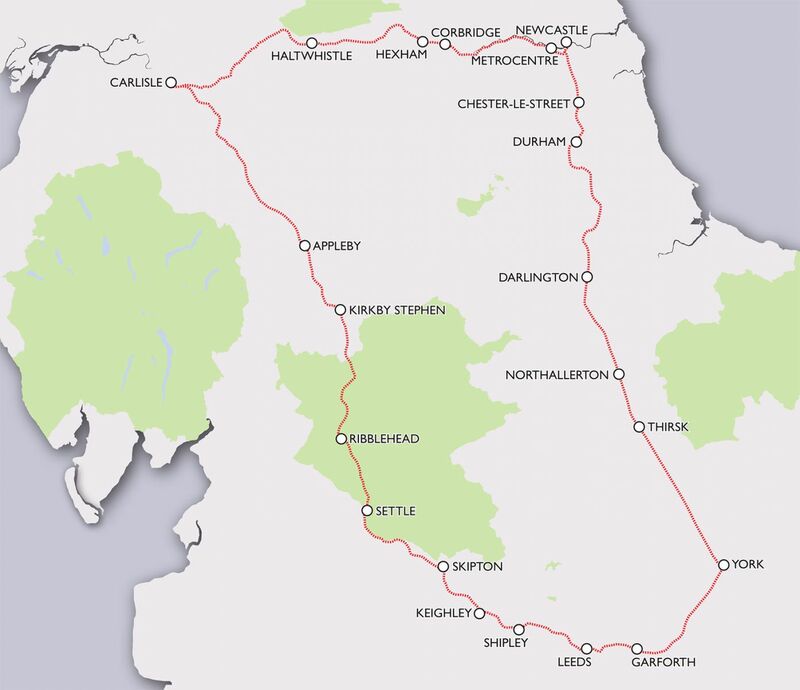 Commence your journey at Newcastle, Durham, Darlington, York or Leeds and then onwards through the Aire Valley, passing Hellifield your train starts the “Long Drag” through stunning scenery to Settle and Ribblehead and onwards to Carlisle. To round off your circular tour you take the scenic Tyne Valley route to Newcastle and back home. This tour is available every day except for Sundays, throughout the year. Constructed in the 1870’s the 73 mile long Settle and Carlisle Railway boasts some of England’s most spectacular scenery. Running through the Yorkshire Dales and the Pennines the railway links the industrial towns of Leeds and Carlisle via some of the wildest countryside on offer. Travelling through its 14 tunnels and over its 22 viaducts (including the famous Ribblehead Viaduct) you will be treated to an awe inspiring journey with ever changing scenery over the most complete piece of Victorian Engineering around. British Rail threatened the line with closure and actually posted closure notices in 1984. However a group of local residents fought these closure notices and against all odds won their battle thus preserving this wonderful line for future generations to enjoy. RailTourGuide are able to offer this trip as an escorted or unescorted day out. Should you choose our escorted tour our guide will travel with you pointing out the sights to be seen and letting you know some of the history that abounds during this journey. Stopping off at Ribblehead for lunch if escorted, you will be taken for a short stroll under the magnificent viaduct and be told stories of the navvies that built the line. It’s a great chance to take some fabulous photos! With flexible departure points and custom made itineraries – this circular tour is ideal for a day out in the English countryside.